Jovanni Sy, in an interview before opening night (see below), said that his dream role was to play the King of Siam in The King and I. He played this role twice before in Ontario and Winnipeg, and his dream role is reprised for the third time at Gateway. Opening night welcomed him and Barbara Tomasic (Anna) with accolades and a standing ovation to boot. 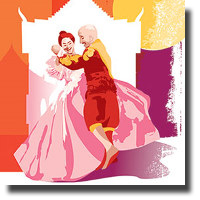 This beloved musical about the clashing of cultural values and the healing power of sympathy for others, is best known for songs like "Getting to Know You", "Shall We Dance?" and "Whistle a Happy Tune". But more than that, the creative team composed of Director Chris McGregor, Musical Director Christopher King, Choreographer Harriet Cheung, Set Designer Marshall McMahen, Costume Designer Carmen Alatorre, Sound Designer Andrew Tugwell and Lighting Designer Adrian Muir delivered a unique presentation with all of the oriental exotique that comes with this musical. The audience was particularly amused with the boys and girls, mostly under 10, who played the children of the king, singing and dancing. I was impressed with the singing of Jennifer Suratos (Lady Thiang) and Rosie Simon (Tuptim). It was an almost three-hour performance, but the audience was fully immersed in the production. Kudos to Artistic Director and lead actor Jovanni Sy and the entire cast and crew for a wonderful production of this classic Rodgers and Hammerstein musical! Jovanni Sy is the Artistic Director of Gateway Theatre in Richmond. 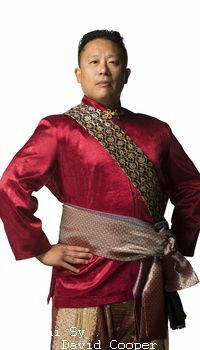 He is also playing the role of The King of Siam in The King and I opening December 6th at the Gateway. How old were you when you immigrated to Canada ? I was only four months old. My family settled in Burnaby but moved to Toronto when I was four years old. What got you involved in the theatre and film world? I started as an actor in 1992. A few years later, I wrote my first short play. And after that, I started to direct. You've played, I understand, in The King and I, in the past. What prompted you to do it again? As a newcomer, I wanted to introduce myself to the community not just as an administrator but also as an artist. I loved this musical and this role for many years. And, if anything, I felt I was too young to play The King all those years ago. I finally feel like I’m the right age to tackle the role. Are you planning to do more Asian-related shows in the future? I was thinking in particular with musicals such as Flower Drum Song? I’m open to all sorts of programming that reflects and celebrates the vibrant diversity of this community. How did you get your position as Artistic Director of Gateway? Were you asked or did you apply for the job? And why Gateway Theatre? I'm sure there were other companies interested, as you've managed other companies before. When Simon retired, the Gateway conducted a national search for his successor. I was based in Toronto at the time, applied, and was selected. 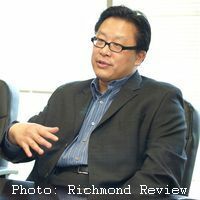 It was perfect timing for me – I was ready and eager to lead a regional theatre and I was particularly interested in Richmond because: (a) it is a forward-thinking, arts-friendly community, and (b) it is blessed with great cultural diversity. Is there anything else you'd like to say about your own professional growth as an actor and future projects for Gateway? We’ve got an exciting new fifteen-year artistic vision called Gateway 2028 that we announced in September. Along with our current programming, we plan on adding new programming that will focus on youth and cultural diversity. Check out our website www.gatewaytheatre.com for details! .